A gargantuan thrash metal project. 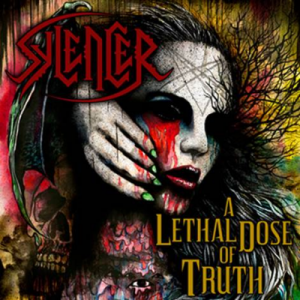 Sylencer’s A Lethal Dose of Truth may feature a crateful of guest performances from metal monarchs, but the colossal meat-and-potatoes thrash springing from Markus Johansson’s project is still very much the Chicago-based musician’s baby. Featuring Johansson, Johnny Rox and Kevin Talley, Sylencer should be set for a significant career. While there are a lot of thrash metal acts and retro groups cooking at the moment, few manifest the energy and technical proficiency as confidently as these dudes. Playing through a round of 16 songs like a boyish Metallica still sowing their wild oats, Sylencer is an exhilarating and lively thrash metal entry. A Lethal Dose of Truth is a sprawling album that can run a bit long, even though the drive never fades. Of course, packing the record full of guests can stretch out the sauce. Sylencer conscripts everyone from lead guitarist Metal Mike Chlasciak (Rob Halford, Sebastian Bach) to bassist Steve DiGiorgio (Testament, Iced Earth) to rip and shred away. A rough count turns up more than a dozen guest artists. Those dreams kick into gear with “Day By Day,” a hurtling piece that introduces the unrelenting rumble Sylencer excels at. The group works to get all the instruments involved in the mix and the guitarists shift through diverse dynamics, moving effortlessly from chugging chording to classic fretwork. “Rise and Die” is another example of the dynamics at play. Effects shower the shredding of Anthrax’s Rob Caggiano, while the resolute bearing leaves plenty of space for Jag Panzer guitarist Christian Lasegue and Dream Theater keyboardist Jordan Rudess to play into the ambitious storm. Further along the road, the plain-speaking thrash of “Dead to Your World” finds Johansson lugging out the fledgling Hetfield-influenced vocals and discarding the decomposing standards of the button-up world. A Lethal Dose of Truth is a gargantuan thrash album. From the surge of “Sinners in the Hands of an Angry God” to the morose Andy LaRocque-assisted “Afflicted,” Johansson’s Sylencer is an astonishing project that inhabits a thrash-happy realm where restraint is a dirty word and bigger is definitely better.